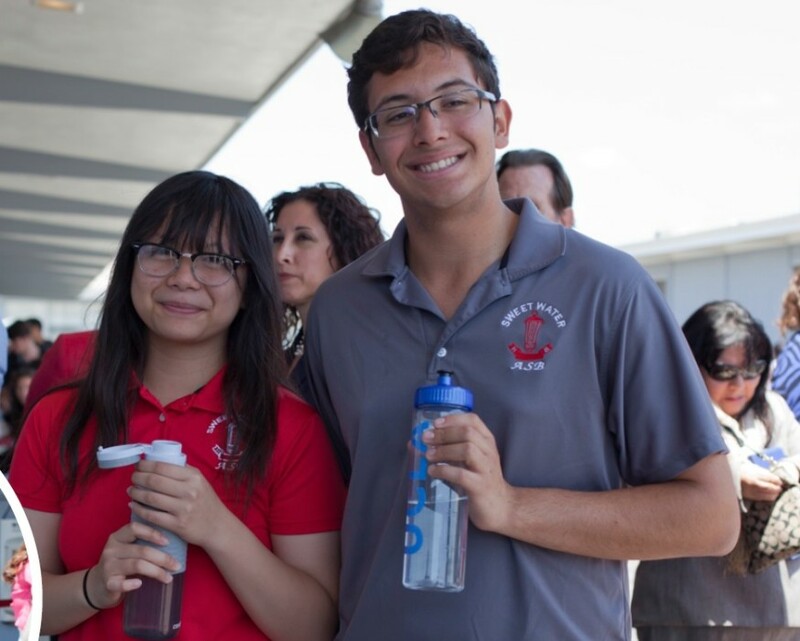 On May 19, 2015, Sweetwater High School, located in National City, celebrated a very important goal of installing its first, sustainable, clean water station that has turned the school into a healthy, vibrant community in its fight to reduce students’ risk of childhood obesity. A student-led initiative made this public health resource possible with the support of UC San Diego-Center for Community Health, UC San Diego-Government & Community Affairs, the City of National City, the National City Chamber of Commerce and The Mile of Cars — all of whom came together as champions for change to provide National City’s only public high school with a free, clean sustainable source of drinking water. 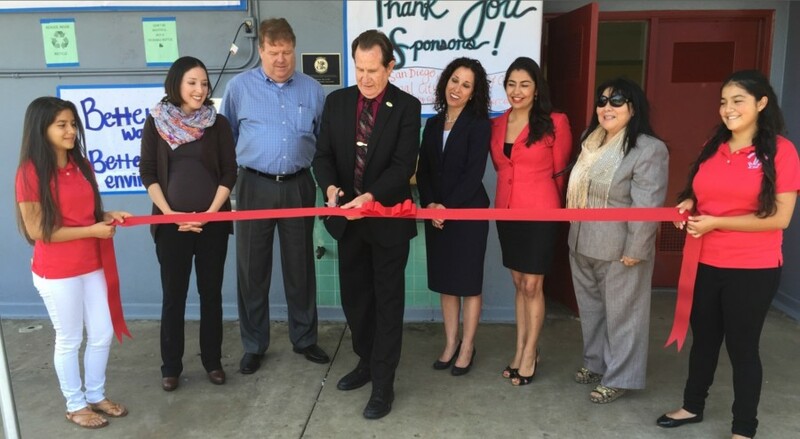 Students at Sweetwater High School celebrated this youth-adult partnership and its successful health outcome with a ribbon-cutting event led by National City Mayor, Ron Morrison, and Sweetwater High School Principal, Maribel Gavin. Students spoke to the importance and positive health impact this water station will have in their lives to empower under-served youth to reduce their risk of childhood obesity. The installation of this sustainable, clean and free water station coincided with National Physical Fitness Month per the U.S. Department of Health and Human Services Office of Adolescent Health. National City has the highest overweight and childhood obesity rates in San Diego County – 50 percent of its children are overweight or obese – a comparison of 18 cities in San Diego County. Although many factors contribute to obesity, including physical inactivity and the consumption of unhealthy food, sugary drinks are the greatest source of added sugars in the American diet and the number one source of calories in teens’ diets according to the Journal of the American Heart Association and the Journal of the American Dietetic Association. Studies done in the U.S. and internationally have shown that one of the strategies to combat childhood obesity is to reduce consumption of sugary drinks and increase consumption of water. For example, a study in Germany titled “Promotion and Provision of Drinking Water in Schools for Overweight Prevention: Randomized, Control Cluster Trial” found that ensuring children can drink water at school, where they spend half their waking hours, can lead to a 31 percent drop in risks of becoming overweight. Many low-resource schools have broken or non-functioning water fountains or their water tastes bad, which discourages students from drinking. Seemingly small, yet significant changes in the built environment of youth can greatly help their behaviors in a way that supports their health. “When students are given the choice of cold, clean and good-tasting water, they are given a vital resource toward healthy living,” said National City Mayor, Ron Morrison. With the installation of the new, sustainable, and free drinking water source, Sweetwater High School students can now make hydration a priority in their lives.